How Can I Still Believe God is Good after the Death of My Child? You are here: Home / Expressions of Hope / How Can I Still Believe God is Good after the Death of My Child? If we have made Jesus Lord of our lives, it overrides everything. It gives Him permission to be God in our lives, no matter what that looks like and includes when we don’t understand what He is doing or allowing in our lives. I am not discounting speaking God’s Word over our lives and those we love, and pressing into Him through prayer. Not at all. But that is not a golden ticket to get what we want from Him and to never have the trial and tribulations He tells us we will have in our lives. We have a young granddaughter who is being taught to say please and is learning that just because she says “pleeeeease” doesn’t mean she automatically gets what she wants. When you ask someone for something, they have a choice to say yes or no. When we ask God for something, He has the choice to say yes or no. Did I want Him to say yes and allow Becca to stay here on this earth? Of course I did, with every fiber of my being! As a matter of fact, I believed He was actually going to heal her heart, either through a miracle or through a heart transplant. I was totally blindsided when she died—even though she was very sick. 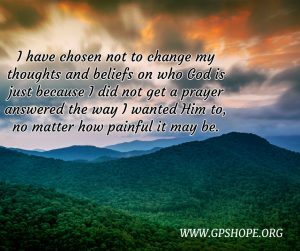 But I have chosen not to change my thoughts and beliefs on who God is just because I did not get a prayer answered the way I wanted Him to, no matter how painful it may be and the deep suffocating darkness it threw me into. And that is what trust is; to believe in someone when what I see or feel doesn’t make sense at the moment, no matter how much it hurts or how wrong I think it is. Your emotions may be telling you that you cannot trust God and that He isn’t good. However, decisions made based on emotions are quite often wrong. I encourage you to make the difficult choice to trust Him, not based on whether or not you get what you want, but based on the fact that if you cannot see His goodness in your situation yet, it means He isn’t done working on your behalf. 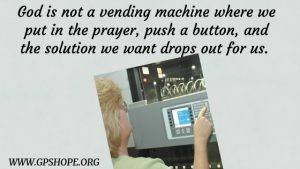 We all have choices to make about trusting God. We ask our children many times to trust us, especially when our decisions cause them pain (and we know what they don’t know, and can see what they cannot see). God is asking the same thing. A greater measure of healing will begin to happen when we decide that we are going to believe in His goodness and trust Him with our lives once again. The choice is mine and yours. And the question becomes: Are you going to make it based on anger, resentment or frustration? Or are you going to move beyond that, believing He knows how to make right decisions for everyone involved, and that He was not willing to compromise in the moment, but held fast because He sees what we cannot see, and knows what we do not know? 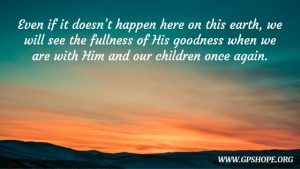 I hope you will join me in believing in what He promises, that even if it doesn’t happen here on this earth, we will see the fullness of His goodness when we are with Him and our children once again. 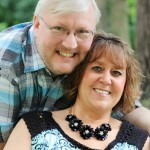 Expressions of Hope is written by author and speaker Laura Diehl to bring hope, light and life to those struggling in darkness after a tragedy, especially bereaved parents. 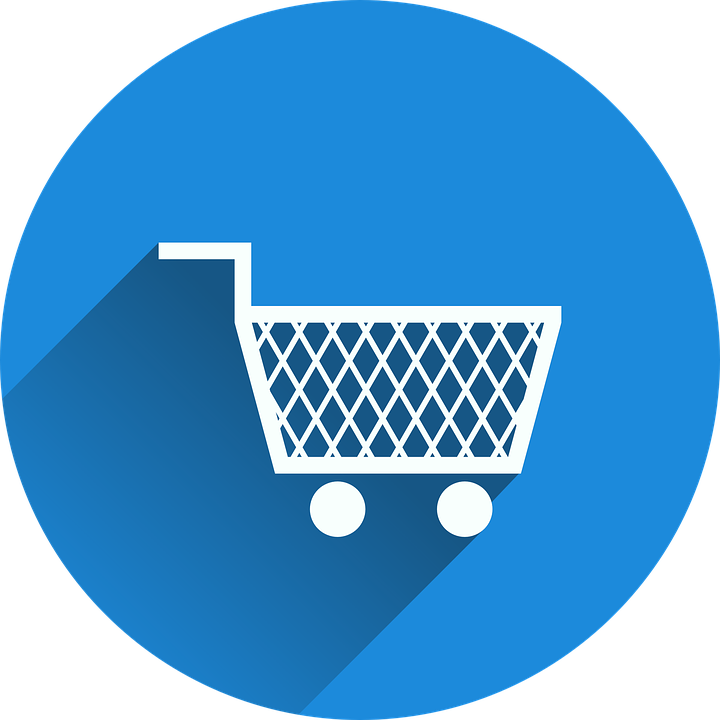 If you would like more information about Laura as an author or a speaker for your next event, click here. 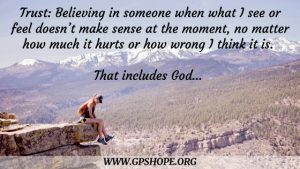 GPS Hope exists to bring hope to parents who have suffered the death of a child, acknowledging their unique grief with support, connection and education for them and those around them.